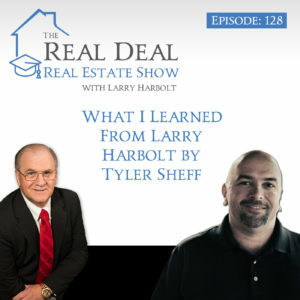 Tyler Sheff guest hosts Larry Harbolt’s show this week to talk about how Larry’s teachings and information have impacted his life and his business. Tyler has sat across the table from Larry many times and has learned an incredible amount of valuable information over the course of the last few years and today he shares several key tips that will change the way you approach real estate investing. Being face to face with people is probably one of the most powerful skills that Larry has taught Tyler. Understanding the personality type of the person you’re talking to is the best way to negotiate effectively. Electronics and fancy jewelry are just going to be distractions from creating the connection you need to create with someone. Leave the Rolex behind and dress respectfully. You don’t want to spook the seller by dressing like a hotshot, but you also don’t want to look like an amateur by dressing like a beach bum. Always be polite and respectful of the seller’s property while you’re there. A lot of people have forgotten what it means to be polite and have good manners. Understand that the kitchen table is where relationships happen and memories are made. The kitchen table is the ideal place to discuss the seller’s options and do business so always try to navigate the discussion to the kitchen. If that’s not an option, make sure that wherever you meet the seller feels comfortable. Most deals fall apart even before the negotiations can really happen because the other person isn’t comfortable in the situation. Remember above all, that you can only buy a house that can pay for its own expenses. You don’t want to pay into your own investments, they are supposed to pay you. Just because you have the opportunity to buy a property, that doesn’t mean it’s the right property for you. Always do the math and make sure you tailor your offers to fix the seller’s problems. When the seller has choices, they feel like they’re in charge and that makes it easier for them to make a decision. Once you understand why the seller is selling the house, you can solve that seller’s problem and provide a great deal that will put a smile on their face and ink on your contract.